Nikon’s compact system camera (CSC) line-up seemed to start well when the Nikon 1 J1 and Nikon V1 were first announced back in September 2011. But after an initial flurry of impressive sales reports, the market seemed to lose interest. However, the changes brought by the latest introduction, the Nikon 1 J5, could see renewed interest from Nikon SLR lovers looking for a smaller alternative. With its new 20.8 million pixel CX-format (one-inch) sensor, the J5 has the highest resolution of any Nikon 1 camera yet. What’s more, the new sensor is backside illuminated, which means that the circuitry is out of the way of the light receptors, allowing them to be larger than they would otherwise be. This should be good news for low light performance. Additionally, as with previous Nikon 1 cameras, the sensor has no anti-aliasing filter, which should make it good at resolving fine detail. A new Expeed 5A processing engine makes the J5 faster, as well as enabling more movie options (the Nikon J4 and Nikon V3 use Expeed 4A). The J5’s sensitivity range also steps up to ISO 160-12,800, whereas the selectable options of the J4 topped out at ISO 6400. In addition, the new processing engine enables a maximum continuous shooting rate of 60fps (frames per second) when the focus is fixed at the start of the sequence. That should be fast enough to record split-second moments such as a water splash or a dog shaking itself dry. In continuous autofocus mode, the maximum rate drops to a still impressive 20fps, a figure that SLR users can only dream about. 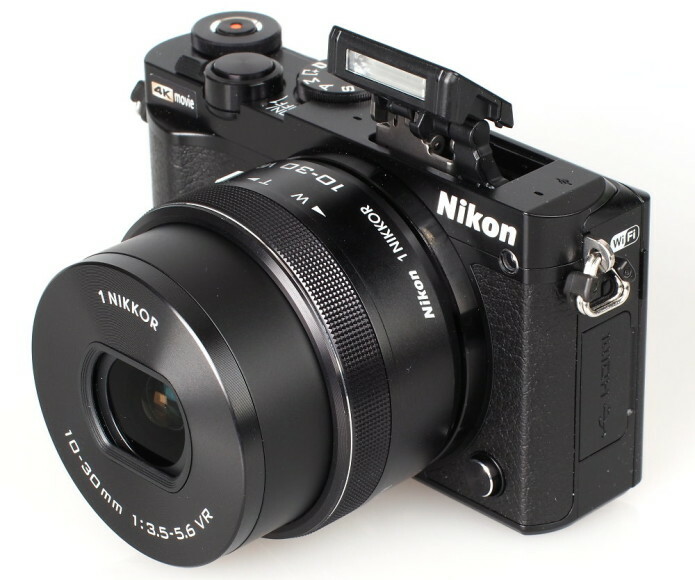 The shutter itself is electronic, and not mechanical like the shutter in the Nikon 1 V3. This has a few advantages. It allows the camera to be smaller, for a start. It also means that extremely fast shutter speeds can be achieved – the top rate offered by the J5 is 1/16,000 second, which is great for capturing fast moving action, or if you want to shoot at wide apertures in bright light. Lastly, an electronic shutter is completely silent, making it good for discreet photography. Like the other cameras in the Nikon 1 line-up, the J5 has a hybrid AF system with 171 AF points, 105 of which are phase detection points, distributed across the imaging sensor. On the back of the camera, the 3-inch 1,037,000-dot screen is touch sensitive and can be flipped through 180 degrees for shooting selfies. It can also be pulled out and tilted downwards, making it useful for shooting above your head – such as when standing in a crowd. By contrast, the J4 has a fixed screen. As soon as the screen is flipped to face forward, selfie mode and face detection is activated automatically. There’s no viewfinder, and unlike with some of the other Nikon 1 models, there’s no hotshoe or accessory port to allow you to attach one either. While the J5 is the first Nikon camera that’s capable of shooting 4K video, it is limited to shooting at 15fps at this resolution – so it is unlikely to prove a hugely popular option. However, full HD video recording is also possible at a range of frame rates up to 60fps. There’s also a 120fps option for 4x slow motion playback. In addition, up to 20 full resolution still images can be captured while shooting full HD footage with no interruption to video recording. Time lapse movies can also be created in camera with up to 300 images and a range of time frames and intervals being available. As you might expect, Wi-Fi connectivity is included in the J5, but there’s also NFC (near field communication) for connecting with an NFC device such as an Android phone. Once it’s connected by Wi-Fi it’s possible to control the J5 remotely using Nikon’s free app. The J5 is available as a body-only kit, but most will probably buy it with the 10-30mm retractable kit lens. The CX-format sensor has a crop factor of 2.72x, making that equivalent to roughly 27-81mm in 35mm terms. You can attach existing Nikon F-mount lenses via an adaptor, but it’s worth remembering that these will also be subject to the same crop factor, making a 50mm lens equivalent to around 136mm. The range of Nikon 1 lenses is much more limited than those available for Micro Four Thirds cameras, but there are still 13 to choose from, covering a total focal range of 6.7-300mm (18-810mm effective). Which cameras are the competition for the J5 is debatable. If you’re a Nikon fan, perhaps one of its DSLR owners, you may find the J5 a tempting purchase instead of buying a compact camera. 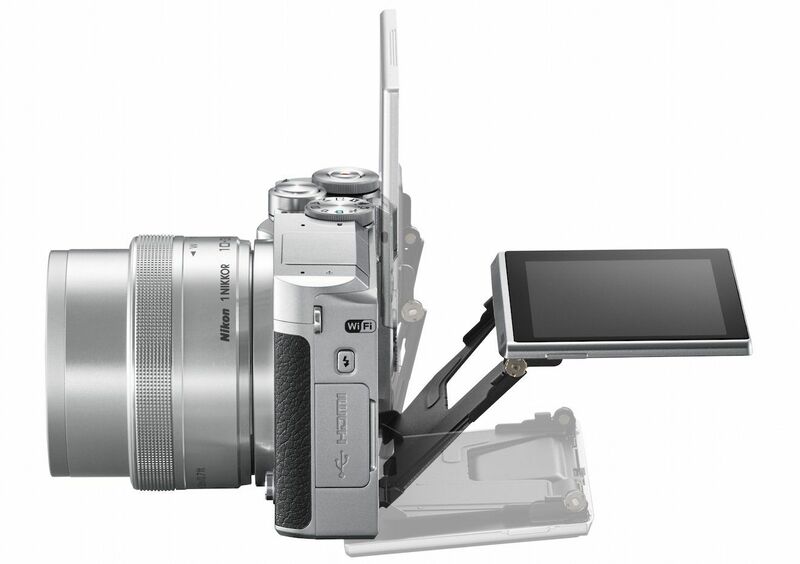 It has the same size sensor as some of the premium compacts on the market, such as the Canon G7X and the Sony RX100 III. In terms of compact system cameras, if you have no loyalty to Nikon, you might want to consider the Panasonic GM5, which has a similar body size but has a larger sensor and a viewfinder.